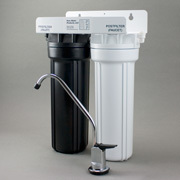 Featuring reverse osmosis, countertop water filters, undersink filters, shower filters, ultraviolet purifiers, water filter replacement cartridges, gravity emergency filters, dry pellet chlorinators, Doulton ceramic filters, aeration systems for iron and hydrogen sulfide removal, compact whole house filters, multi-cartridge stainless-steel filtration units, chemical feeder systems, hydrogen peroxide feeders, backwashing filters, water softeners, garden hose filters, sediment filters, carbon block filters, KDF cartridges, pumps, and much, much more. From top makers like MatriKX, Flowmatic, Omnipure, Pura, Sprite, Wellpro, Fleck, Alamo, Watts, Stenner, AERMAX, & Doulton, as well as our own tough & reliable Black & White Reverse Osmosis series of drinking water systems. Browse the main categories below, or go to the simple alphabetical product listing. 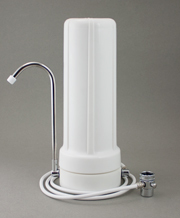 Countertop Water Filters. Our classic Model 77, the world’s greatest $77 water filter, is the only water filter we know of that has an unconditional lifetime guarantee. Several styles and many cartridge options are available. This is a sturdy, effective water filter that installs in a jiffy (or less) and lasts a lifetime. Parts for Countertop Water Filters. Undersink Filters. Single, double, and triple filters, our new compact triple unit, and even a quadruple filter. Several vessel styles, many filter cartridges, and long guarantees. These are tough, reliable performers. For standard undersink units with inlet valve and their own ledge faucet, click on the picture or title link. For simple undersink units that filter all water that comes from your present cold water faucet, click here. Undersink Reverse Osmosis. The link at right will take you to our reverse osmosis entry page, where you’ll find basic pictures and details about our several fine undersink styles. These include our own brand, the classic Black & White unit that we’ll customize to your needs, our easy-to-service Q Series units, a superb economy unit (twice as good as the “big box store” units at a comparable price), and much, much more. 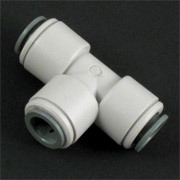 Need a part for your reverse osmosis unit? Go here. Whole House, Light Commercial Reverse Osmosis. Reverse Osmosis for point of entry. From 300 gallons per day to 12,000. Superb factory-ready systems with all the usual accessories factory installed. Filter Cartridges. We stock a large selection of the most popular sizes, featuring MatriKX extruded carbon blocks and Di-Tech-style specialty cartridges. Also, Doulton ceramics, Omnipure Q and K series, Gold Series Inlines, filters for Microline and Hydrotech units and much more. Shower Filters. We’ve got Sprite—the best we can find—and we sell only styles with replaceable cartridges. The Sprite “High Output” is the best seller, but we have the Hand Held version as well. Great prices on both filters and cartridges. Compact Whole House Filters. 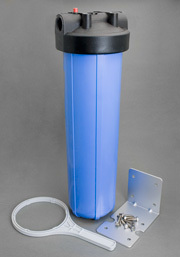 These inexpensive, compact cartridge-style units provide efficient removal of chlorine from city water with little pressure drop and serve a variety of purposes for wells. If the basic units don't suit your needs, we can customize. For the 20" Unit (the most popular for whole house use), go here. For the 10" Unit, go here. 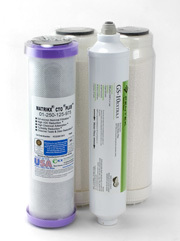 Large Filters and Softeners. 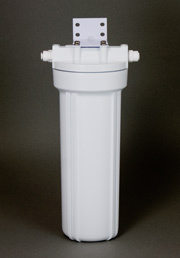 Filters for removing chlorine from city tap water, for removing iron and hydrogen sulfide from well water, for removing excess sediment—and more. Simple, effective yet inexpensive softeners, all made with standard industry parts from Fleck, Structural Fibers, and other top makers. If you don't see what you want, please call or email. 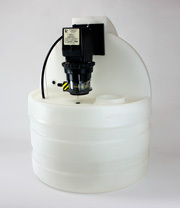 We can supply virtually any style or size of softener or backwashing filter. Go here for Large Backwashing Filters. 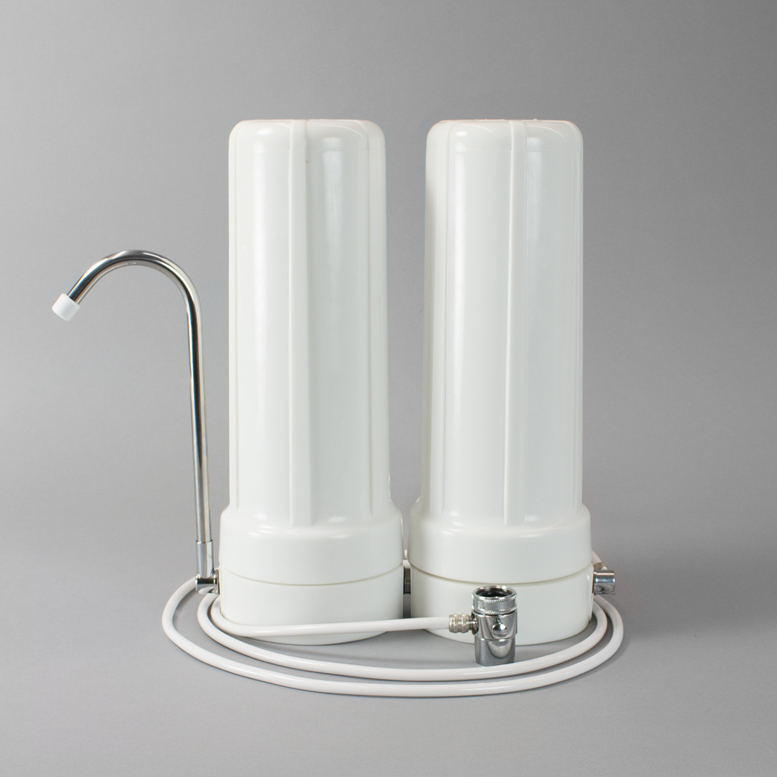 New: Our Whole House Unit for Chloramine Removal. Go here for Water Softeners. 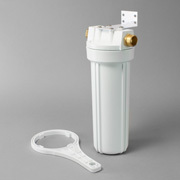 Go here for our Scalenet Water Softener Alternative systems. 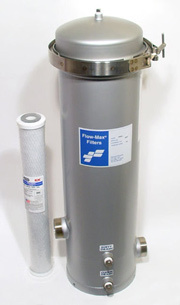 Our new Filox filters for iron and hydrogen sulfide. 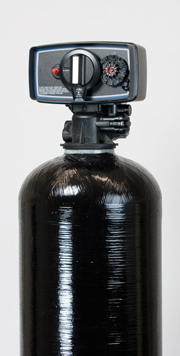 Air Injection Systems for Iron/Manganese and Hydrogen Sulfide Removal. 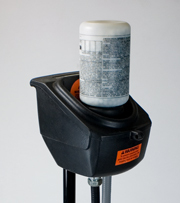 We have Aer Max™ aeration systems with many options that we've added for highly effective, chemical-free treatment of well water. 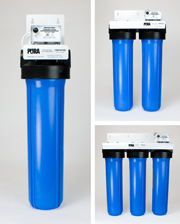 Pura Ultraviolet Systems Pura ultraviolet units to rid water of bacteria. 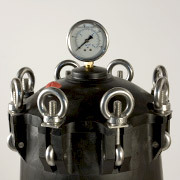 Many sizes—from an undersink add-on drinking water unit to the “Big Boy” series, capable of handling industrial applications. 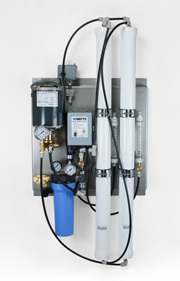 Ultraviolet keeps the chemicals out of your well water and out of the environment. It’s the cleanest and easiest way to get rid of bacteria in water. 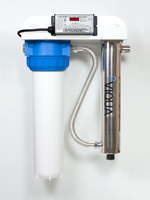 VIQUA Ultraviolet Systems UV disinfection systems manufactured by VIQUA. Undersink and whole house units featuring stainless steel reaction chambers, high dosage UV lamps, a wide range of top quality accessories and industry leading build quality. Watts Ultraviolet Systems High quality stainless steel ultraviolet units. Simple to install and service, Watts UV units provide an affordable and effective option for safe, chemical free disinfection of microorganisms. Add-on Filters. Unique to our site, this very useful page allows you to make easy and inexpensive additions to your existing filtration system. 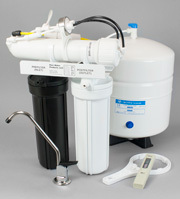 Add fluoride removal, sediment reduction, lead removal, for example, or simply increase the capacity of your drinking water filter by adding an extra stage of carbon. Like most things in life, this page is continually in progress. If you don’t find what you want today, please come back tomorrow. And don’t hesitate to call about product alterations and substitutions. 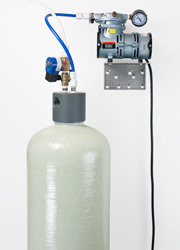 We like custom-making water treatment systems to your needs. And if we don’t have it, we can usually find it. We welcome telephone orders and will be pleased to help with selection. If we miss your call, please leave a message we’ll return your call promptly. And we also try to answer email as promptly as possible. Fill out your e-mail address to receive our newsletter!—the Pure Water Occasional. Please Note: Our online magazine, the Pure Water Gazette, has moved to www.purewatergazette.net.